فهرست پایتخت‌ها در پاکستان (انگلیسی: List of capitals in Pakistan) دربردارنده اسامی شهرهای بزرگ و پرجمعیتی است که مرکز حاکمیتی یا قضایی ایالت‌ها و استان‌های کشور پاکستان است. ↑ "The Constitution of the Islamic Republic of Pakistan". National Reconstruction Bureau, Government of Pakistan. Archived from the original on 2007-12-15. Retrieved 2008-01-03. ↑ Gwillim Law. "Pakistan Provinces". Statoids.com. Retrieved 2008-01-03. ↑ "Population size and growth of major cities". Population Census Organization, Government of Pakistan. Archived from the original on 2010-12-22. Retrieved 2008-01-03. ↑ Stefan Helders. "Pakistan - largest cities and towns and statistics of their population". World Gazetteer. Archived from the original on 2013-02-09. Retrieved 2008-01-03. ↑ "Administrative system". 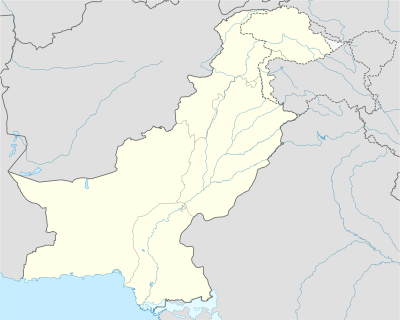 Government of the Federally Administered Tribal Areas. Retrieved 2008-01-03. ↑ "Kashmir and Northern Areas Division". Government of Pakistan. Archived from the original on 2006-12-10. Retrieved 2007-01-03. مشارکت‌کنندگان ویکی‌پدیا. «List of capitals in Pakistan». در دانشنامهٔ ویکی‌پدیای انگلیسی، بازبینی‌شده در ۲۳ فوریه ۲۰۱۸. این صفحه آخرین‌بار در ‏۲۶ فوریهٔ ۲۰۱۸ ساعت ‏۱۸:۴۷ ویرایش شده‌است.